What does a town under quarantine—walled off against the world, shutting its doors against commerce—feel like? What if those doors have been forcibly shut, against the citizens' will? What is it like to be medically captive in a city? At the very least, how does one pass the time? Nearly two years ago, while living and working in San Francisco, I would often spend my lunch breaks down at Stacey's, an amazing bookstore that sadly went out of business this past spring. 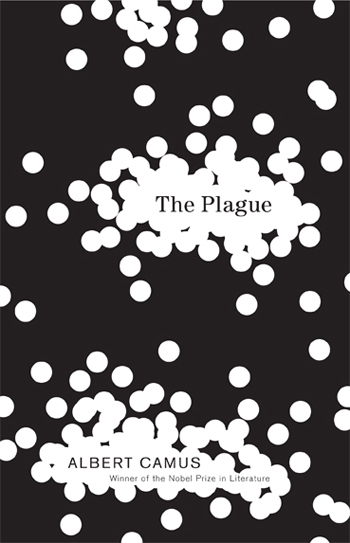 One of the books that I gravitated toward—and eventually purchased—was The Plague by Albert Camus. Camus's novel—about a quarantined city in North Africa called Oran, where the bubonic plague has erupted, originating in rats that have come crawling out into the streets to die en masse—seems to illustrate quite well the proposition that fiction is an extraordinarily effective medium through which to describe architectural and urban experiences. One of Camus's characters, for instance, surveys the quarantined city laid out before him: "At that moment he had a preternaturally vivid awareness of the town stretched out below, a victim world secluded and apart, and of the groans of agony stifled in its darkness." Quarantine, Camus suggests, can have the effect of heightening the sensorial impact of certain urban details: "For in the heat and stillness, and for the troubled hearts of our townsfolk, anything, even the least sound, had a heightened significance. The varying aspects of the sky, the very smells rising from the soil that mark each change of season, were taken notice of for the first time." The city has become amplified, so to speak, by its isolation. We even read that a "new paper has been launched: the Plague Chronicle," as if all of these newly noticed details, and the alterations in daily routine that revealed them, were too numerous—and far too extraordinary—not to catalog. I won't review the book here; it is worth reading, even if it's emotionally imperfect, so to speak (and often a bit boring), but its literary merits are not what I'm concerned with. I'm concerned with its descriptions of space. I thought, then, especially in light of the quarantine studio that kicks off in NYC this autumn, I would simply excerpt some of Camus's more memorable thoughts on quarantine. Oran, Camus continues, its city gates closed against foreign visitors, its citizens often sitting there, listless in the desert heat, "assumed a novel appearance." For all of these descriptions, however, the question remains: what is the effect of quarantine on a city's populace? Can public policy reach down into the emotions of a resident and predict how he or she might react? And how is urbanism itself transformed by states of temporary—but enforced—isolation?